We are a “Life Prep” school. We give kids the tools they need to be successful in life. The youth of today need to be focused, empowered and confident. They need to have internal strength that overcomes failures, set backs and challenges. They need tools that will carry them through fearful struggles and future moments of unfairness. They need to know how to deal with adversaries/bullies at school, demanding bosses in the workplace, tough assignments in college, and tough odds in challenging careers in adulthood. Our school covers all these things. The only requirement in order for the student to be successful at our school is regular attendance through black belt. If they don’t show up regularly, they won’t reap the rewards. As such, the parents are a pivotal role in the child’s success. If you get them to class and make sure they continue their training even when it gets challenging, I assure you the results your child achieves will be astounding. Many of our students come from challenging pasts. Some were bullied in school and learned not only to overcome being a victim, but became champion competitors. A few of our students were diagnosed with ADHD and through diligent practice became focused students at school with high grades. Others were shy and had low self-esteem. Through diligent practice they emerged from their shell to become confident warriors. We have a student who was accepted into Yale University, and another, Chelsea Davis, who is now a news reporter with Hawaii News Now. How did they do it? Was life easier for them? Actually, they faced the same challenges in school as everybody else, except when the challenges arose, they didn’t give up or lose confidence. Instead they worked through the challenges; knowing that eventually they’d succeed if they persevered. Confidence is everything these days. The working world is more challenging than it’s ever been. Merely desiring to be a doctor, a lawyer or a news reporter is not enough as thousands of other students aspire toward the same goal. Only those with that “extra edge” can rise to the top of their profession. We teach kids how to achieve that “extra edge”. Ballet, Baseball, Soccer or any other sport, although being fun activities ,will not turn your child into a leader. If you desire your child to have that extra edge in order to be successful in life, I urge you to enroll your child in our program. It won’t be easy. Sure, it starts out fun, but eventually they must do what is necessary to achieve the status of black belt. We offer numerous classes, expert instruction and plenty of assistance to get the job done. But in the end, the student is responsible for staying the path. Our Kids Smart Safety program increases overall awareness in our children. Using body language and their voice to show confidence, recognizing danger in it’s various forms as well as keeping a safe distance are learned through role playing. The physical self defense part teaches escapes from grabs and effective strikes/kicks for kids their size and age. Our program works for bullies and their victims alike. We have had instances where the bully and his prey ended up in the same class. By training side by side with our black belt role models bullies quickly realize that their behavior was wrong and end up being protectors from other bullies of their former victims. Kids and Teens saying NO to drugs and other harmful substances or actions is of major importance for parents today. By teaching our students to become leaders and take responsibility for their actions they will not succumb to peer pressure and instead become advocates of a healthy lifestyle. Did you know that Taekwondo has been proven to improve study habits and overal school performance? Becoming a Kukkiwon certified Taekwondo black belt in our school also increases your child’s chances of being accepted or receiving scholarships at prestigious Universities/Colleges. One of our black belts Kellen Bean recently got accepted into Yale University. Chelsea Davis, another one of our black belts and National gold medalist competitors is now a TV reporter for Hawaii News Now. 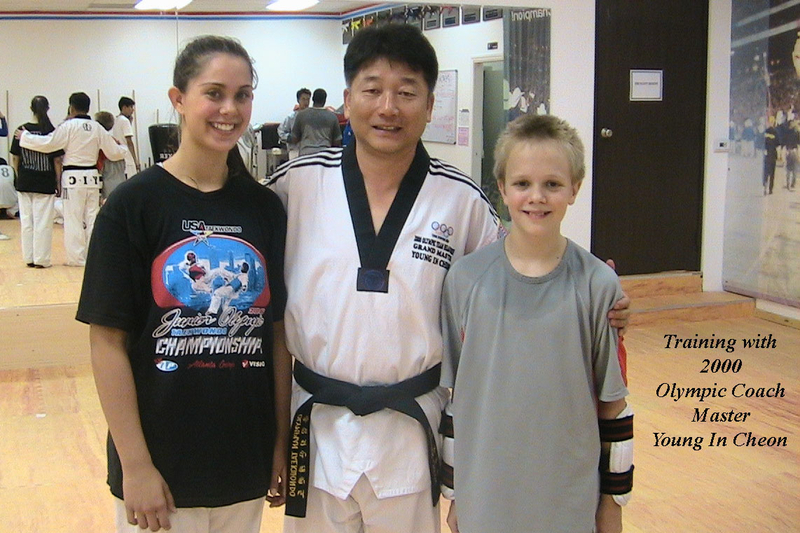 The picture below shows Chelsea with Master Miles in 2006 after training with 2000 US Olympic Coach Grandmaster Young In Cheon in California. Did you know that Taekwondo is 10 times more effective than Team Sports in developing a child’s self esteem, confidence and discipline? Everyone started as a white belt and still remembers how he/she wanted to be treated when they were “grasshoppers”. Peer pressure gives way to encouragement and personal achievement. A positive and supportive attitude always exists among peers in Taekwondo. We realize that every student is unique and has different aspirations. Competing in tournaments is optional. Although we also feature a competition training program for students, that are interested in competing at local, national and international levels, it is run as a separate program. Our motto is “Nobody sits on the bench or feels “left out” because earning your next belt has nothing to do with your competitive edge. It’s all about perseverance and becoming disciplined in your practice and in life. Being overly talented sometimes becomes a hindrance in achieving long term goals. A high percentage of our black belts and even some of our top competitors started off being not being very coordinated or athletic. They outlasted and surpassed most of the super talented “prodigies” that came and went.